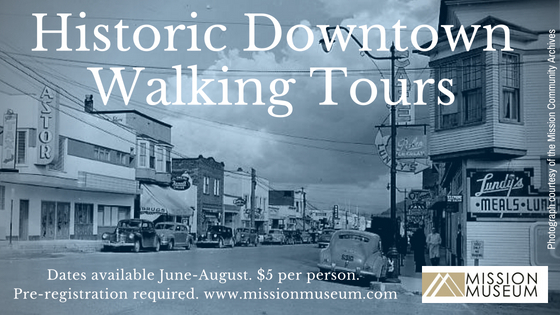 Join us for a guided walking tour of Mission’s Historic Downtown! Discover the old Victory Theatre, the home of Mission’s first radio station, which building was first a livery stable housing Clydesdale horses and more! Tours are held bi-weekly on Thursday mornings at 11am, from June 21-August 16. And don’t worry, we’ve adjusted our tour this summer to give you all the info, without having to wander through the construction as our downtown core gets a face lift! Tours begin at the Mission Museum, and run for approximately 1 hour – or sometimes more, depending on how many questions you ask! Tours run rain or shine, but we have umbrellas, just in case. Cost per person is $5 and pre-registration is required. In the event of a tour cancellation, all monies will be refunded.